Averyanov Y.A. Hadji Bektash Veli and the Sufi Brotherhood Bektashiyya [Хаджи Бекташ Вели и суфийское братство бекташийа]. Moscow, Mardjani Publishing House 2011. (Bibliotheca Islamica). The present work is devoted of Bektashiyya as one of the most eminent mystical Turkish brotherhoods. According to the Ottoman tradition this brotherhood was founded by a wandering mystic Hadji Bektash-i Veli from Khurasan, the historical province in the north-east Iran. This book is divided into ten chapters with the introduction and conclusion. The monograph is based on the study of historical sources and legendary materials about the community of early adopters of Hadji Bektash Veli in Anatolia and adjacent countries. 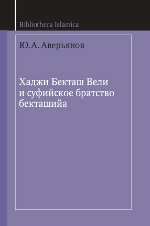 Among the important problems the author reconstructs the biography of the eponym of Bektashi order, Hadji Bektash, through the detailed study of this community it is possible to comprehend closer the process of the emergence and development of Sufi brotherhoods in Asia Minor and the characteristic features of the culture of this region of the Islamic world of the 13th-16th centuries.